Small brewery in Bermondsey. 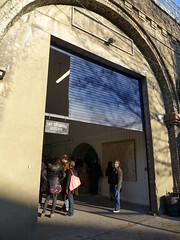 Previously under the railway arches on Druid Street near Maltby Street photo, it moved to Dockley Road Industrial Estate at the end of March 2012, in an area full of small food and drink producers called Spa Terminus. On Saturdays they are open for people to come and buy beer. As of March 2011, most bottles are £2.50 with the size of bottle varying to create per-volume price differences, though the Imperial Stout is £4.50 for a 330ml bottle. The beers are normally quite strong. The Porter and the Export Stout are both very good, in bob's opinion, and Ewan agrees, noting also their excellent collaborations (such as the lovely Dark Mild with Tottenham's Redemption Brewery). secretlondon also thinks Kernel's stuff is great! Their other beers are quite hoppy. From 2012 to 2015 it included a bar area which was open during visiting hours; however, this ceased to operate after August 2015. Last visited by secretlondon, February 2016. Opening hours taken from the Kernel Brewery website, September 2015. Last edited 2016-08-14 14:10:10 (version 19; diff). List all versions. Page last edited 2016-08-14 14:10:10 (version 19).